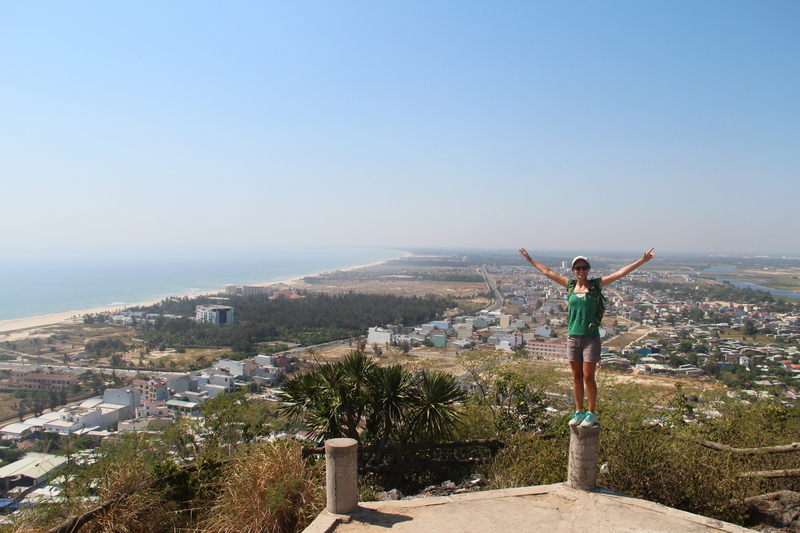 Danang (or Da Nang) makes for a nice stop between the imperial capital Hue and the tourist favorite Hoi An. 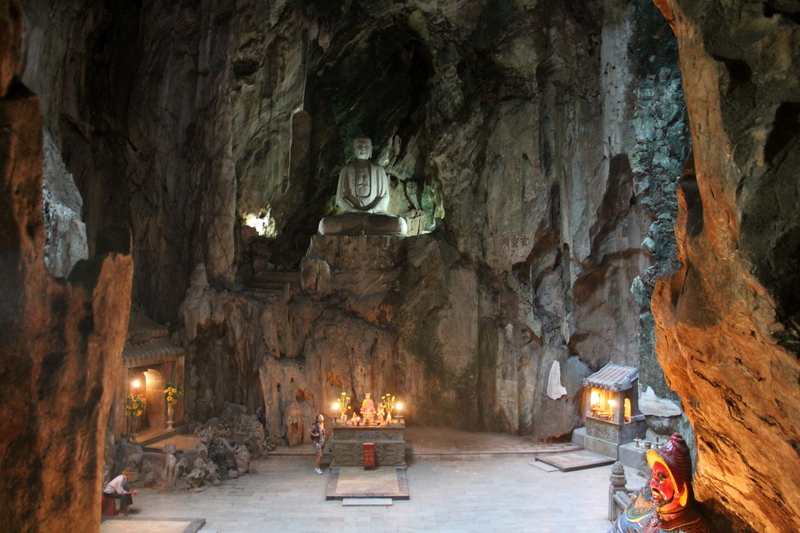 Most travelers visit its most famous site, the Marble Mountains, as a day trip from either one of those. But, as usual, we wanted to avoid organized tours, and found a simple way to do it on our own. First, we had to take a 3 hour public bus from Hue, which dropped us off in the center of Danang late afternoon. After finding a hotel (which wasn’t particularly easy, the central neighborhoods didn’t seem prepared for tourism) and dropping our backpacks off, we went for a walk. 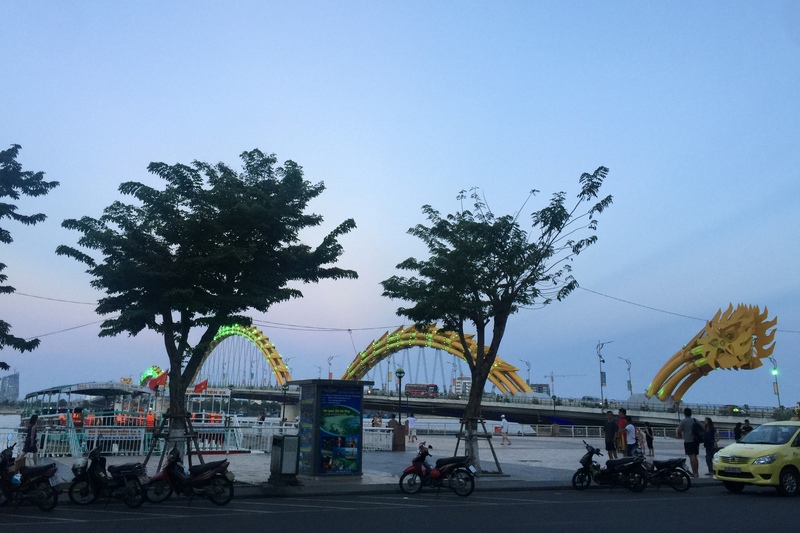 We didn’t have any expectations for this city, the third largest in the country after Ho Chi Minh and Hanoi, but we were positively impressed. It was modern, clean and lively, particularly by the oceanfront and the dragon bridge. There were very few foreigners and it took us a while to find someone who would arrange a driver for us the following day. We wanted a car to take us to the Marble Mountains, wait while we visited, and then take us to Hoi An, which we ended up getting for 200,000 VND (~$9). The Marble Mountains are 5 nearby hills, each named after one of the elements (earth, water, fire, metal and wood), with Thuy Son, the water one, boosting the most “attractions”. We arrived at the bottom of the mountain very early in the morning, trying to beat the heat and the crowds. The whole area is packed with marble sculpture and crafts shops, which used the rocks extracted from these mountains until it was forbidden. We ignored the elevator (yes, they’ve built one!) and started to hike up. 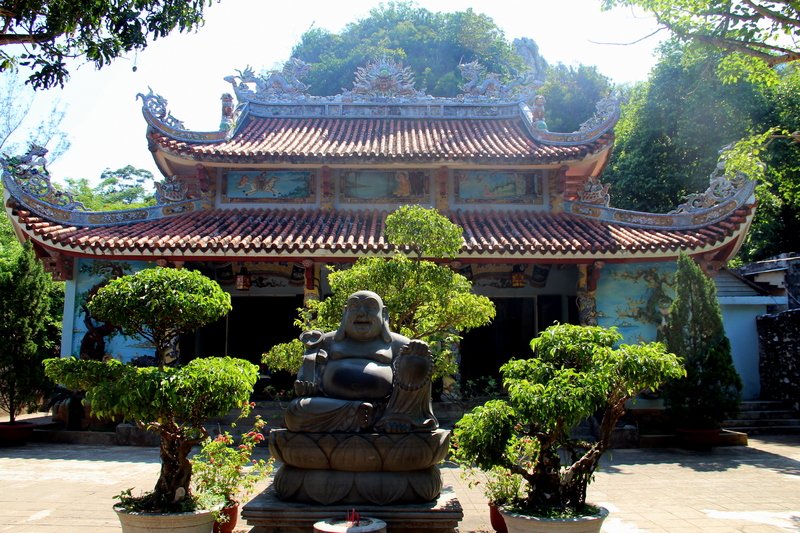 On the way, we stopped at some cute temples and numerous white Buddha statues. We checked out a couple of caves, not particularly interesting, and made our way to the highest point, where we enjoyed some great views of the ocean and the rest of the Marble Mountains… and some refreshing breeze. We continued walking and reached Huyen Khong cave, the most impressive sight of the day. The cave was huge, strangely illuminated by light beams filtering through holes in the rock. 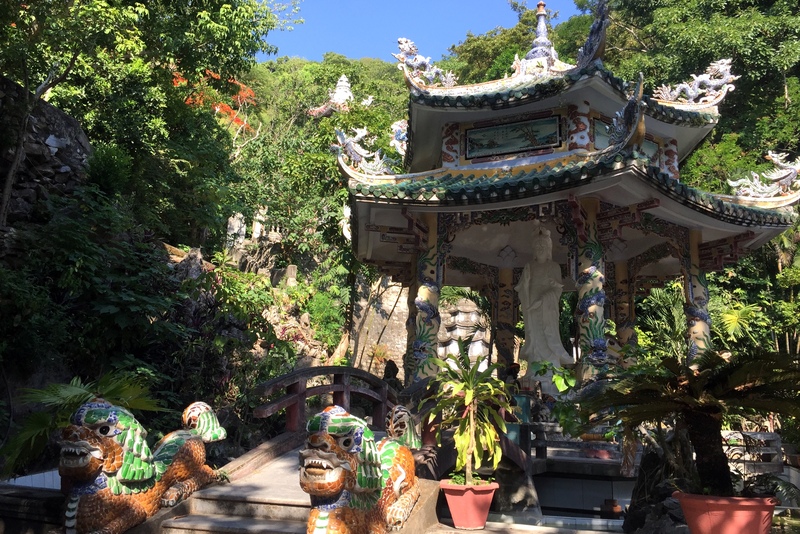 It contained several Buddhist and Confucian shrines, colorful statues and even a plaque reminiscing its use as a hospital during the Vietnam War. After soaking in the atmosphere of the grotto for a while, we visited a couple more Buddhist and Hindu temples, and then started the descent on the opposite side of the hill. We liked this area; it was quiet and the structures were beautifully decorated. 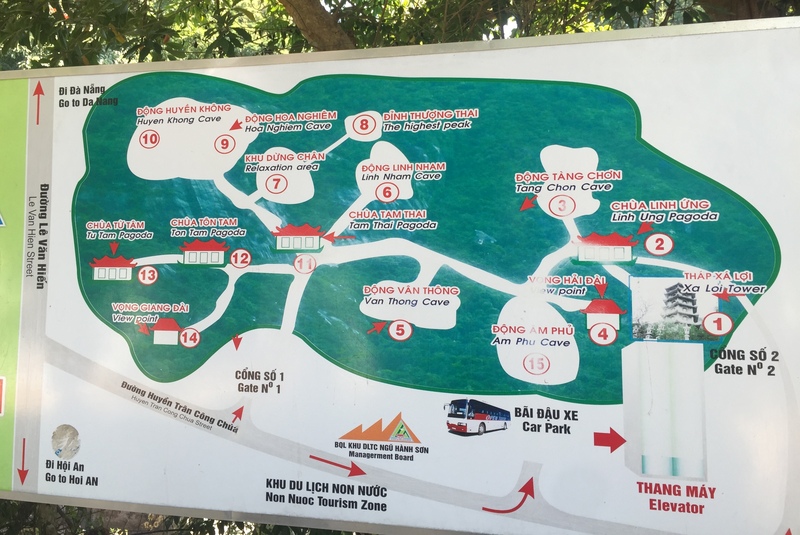 All in all, it took us about 2 hours to explore Thuy Son, as we had planned. But when we came down and walked back to the main entrance, our driver wasn’t there… except that it wasn’t “our entrance”, the whole road just looks the same, with those quirky marble shops one after another. The driver eventually found us, and drove us to Hoi An in 20 min, right on time for a well-deserved lunch. I don’t have his contact info, but I’m sure you can get a cheap driver by asking around once you’re there, definitely much better than when you try to book online ahead of time. Question, when your driver waited for you, what did you do with your bags?! We left our big bags in the trunk of the car, obviously taking the most valuable items in our day-packs… I don’t see any alternative; that’s why it’s important to hire the driver linked to a solid business in town that you can refer to if there are any issues.